Heading over to Blogger. Sorry WordPress. The last handful of times that i’ve tried to put together a post on WordPress if been disappointed that i could not get the pictures where I wanted. This may be due to my lack of computer knowledge, but in any event it put me over the edge and I started looking for a way to transfer my posts to Blogger where I already had another blog going. So, this is is for my wordpress blog. Temporal Millionaire will be hosted from here on out on Blogger. Go there now and leave me a message, really…it’ll be fun! 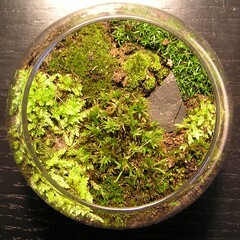 I heard about moss gardens somewhere and had it on my list of things to do with my little guy. I did a little looking on the internet and found this post by Ciao Birdie helpful. Like everything these days I wanted to do this project on the cheap and I did! I took my little helper to the thrift shop to see if we could find suitable containers and we did. We each picked our favorite container ($2 for both). The only other thing we need was something to keep the dirt from going through to the rock. Ciao birdie suggested horticultural charcoal, but fearing that something that sounded fancy might be expensive, I bought a small bag of sphagnum moss ($3.50). We found the rest of the needed supplies in our yard. I took a few containers and we started our collection. One bowl of pebbles, one of dirt, and then one of assorted moss. I was amazed at how many different kinds of moss we found in our yard. I had never looked at it that closely before. I think we found six different kinds. We brought everthing to the table and got to work putting in all the layers. First pebbles, then sphagnum moss, dirt, and finally the moss. He really enjoyed making his garden and so did I. Here is my finished product. The bowl is about the size of my palm…it’s super cute. 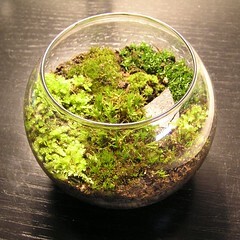 Oh, and I went with bowls that did not have a top because I knew my little guy would want to “take care” of his moss. I gave him a mister to spray it whenever he wants. It evaporates at a rate that keeps it from getting too wet with all the misting. Just right! A good project for about $5.50. I drew these little guys in my sketch book the other night. 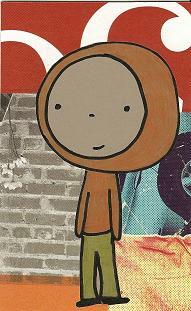 Today I drew a couple on 4″ x 6″ matte board and added some collage. 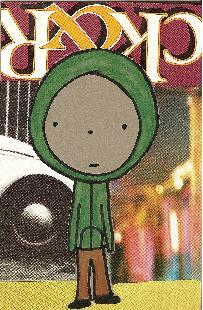 The green guy didn’t scan as well, maybe that’s why he looks kind of bummed out. One day I wanted to eat sushi…I thought and thought and thought about the sushi. 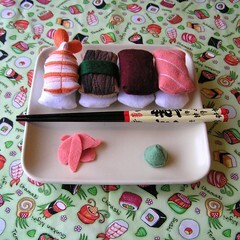 Oh how yummy it would be to eat sushi. I did not have any sushi. I did not have money to buy sushi, but I did make this delicious stuffed set of sashimi. All of the pieces snap together for loads of sashimi making fun, and best of all you can throw them all in this cute little bag with a sushi print. YEAH! 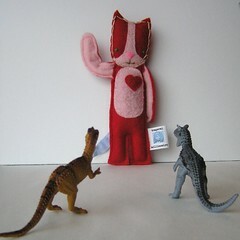 This went up at my etsy shop today. Time to gear up for Cyber Monday! These are some of the latest Travel Kitties I made. I think I was looking for a reason to use bright colors and the dancing bears came to mind. They are cute and happy like these kitties. I just started putting these guys up at my etsy store, which despite my efforts to stockpile my kitty supply…it has been bought out. I’ll see if I can fill it back up before Black Friday. Oh, on that note if you have not taken the handmade pledge, now is the time…support an artist! Thanks for visiting! Let me know what you think...leave a comment. Really, it will make me happy.